For those that aren't aware, I have been an avid 'outdoors man' for years andhave enjoyedbackpacking, canoe tripping and motorcycle/car touring/camping for most of my life. Bargain Basement 'gear' just doesn't cut it with me as my life may depend on quality(not necessarily expensive!) gear to keep me safe and comfortable when I'm miles away from the nearest human, so no Walmart/Kmart offerings find their way home with me. 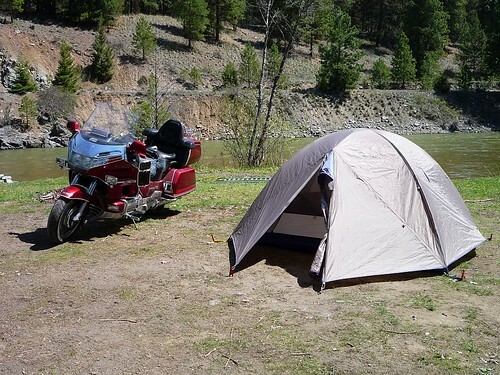 I have been contacted by various members for advice on camping gear and I thought that I would just post a review of a great tent that is of generous size, reasonable price and doesn't take up a lot of room while packed on your bike. My Backpacking tent/shelter although extremely light and compact for a 2 man tent, is just not big enough to easily change in/out of my riding gear. 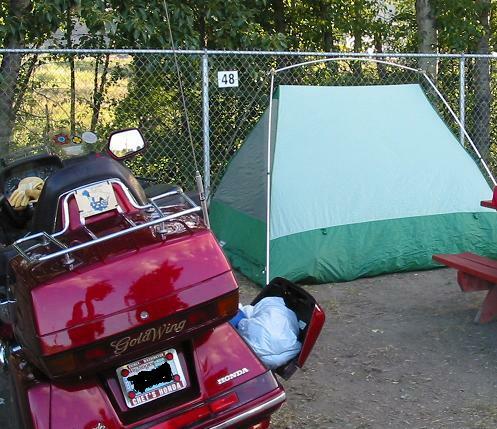 My regular car camping tent is a bit too much for motorcycle touring, without a trailer. It is rather bulky/heavy and doesn't have 2 protected vestibules like it's smaller sibling belowhas. MEC's Wanderer 2, A 2 man - 3 season tent. While a little bulky/heavy to be termed a true backpacking tent, it isn't so bad when split between 2. It's also ideal for canoe tripping, motorcycle touring and even car camping. It has a fairly generous amount of floor space for a 2 person tent, with 3.4sq.m/36.6sq.' and 2 large vestibules that fully protect the inner tent during downpours. The full coverage fly is made of 75-denier polyester taffeta, polyurethane-coated for waterproofness to 2000mm. and all seams are factory taped/sealed. The floor is made of MEC's HT-Sealâ„¢, polyurethane-coated for waterproofness to 10,000mm. It has 2 full vestibules, which open in a variety of ways and has 2 hooded vents, to help expel condensation. 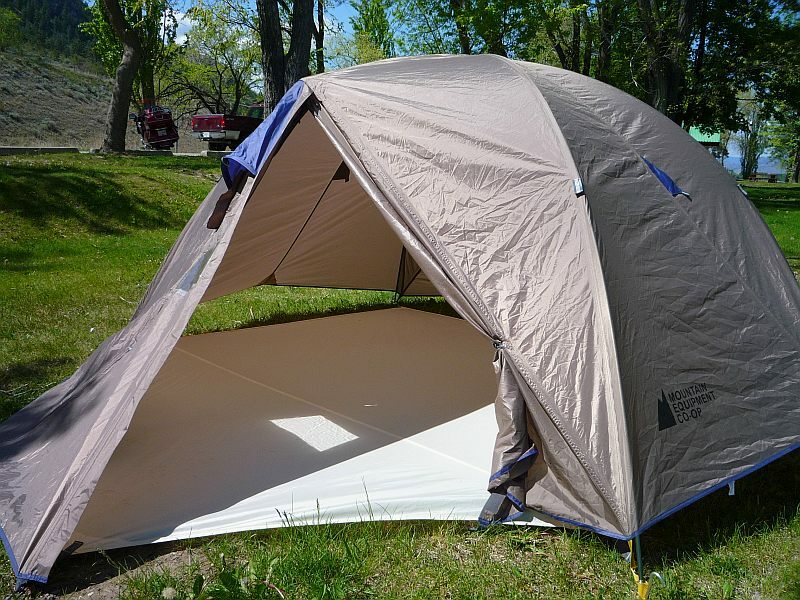 I have found it very roomy when used by myself and I would imagine it fits 2 people without being 'squished', as is the case with most 2 man tents. It has very good headroom and the slant of the walls is such that it allows lots of elbow room. Overall, I'd rate this tent as better than any Sierra Designs/REI/Kelty tent I've ever owned and I've owned a lot of tents over the years. I currently own 4 other tents, as I've sold off a few of the ones I don't use much anymore. Good review, Dusty..... Red and I have been snoring in a Eureka 4-person Timberline for years now..... I probably should look around some at newer or at least different offering. So far, the A-framed Eureka has met our needs fairly well...... In your opinion, are there marked advantages of the MEC over our old Eureka? If I was in the market for a tent, I'd go for that one in a heart beat just because I know that you wouldn't steer anybody wrong. Your da man when it comes to camp gear. I have the same tent as CJ because he and others made the recommendation and I don't regret it at all. I thought it was a goner when golf ball size hall started pelting the devil out of it at Mt. Rushmore. But she held steady with no scares what so ever. Looking forward to putting it to use in Utah, come Sept. I don't have the vestable for it though. Thinking I should look into it, and maybe the footprint. Although a piece of plastic does the trick. In your opinion, are there marked advantages of the MEC over our old Eureka? CJ, if that tent you're happy withis serving you well and is still in good shape(waterproofing, flysheet not degraded due to UV rays) I'd stick with your trusty tent. Just like the ole' saying - 'don't mess with it, if it don't need fixin'. Comparing the 2 man Wanderer 2, to theEureka 2 man Timberline XT, the Wanderer 2 has more headroom(not just in the centre portion of the tent)and because of it's dome design, more overall'usable living space.' The Timberline has 38sq' vs the Wanderer's 36.6 sq', but due to the tent designs, the Wanderer has more usable interior floor space. The Wanderer 2 is heavier, but it also includes 2 larger vestibules. The Wanderer 2 has a heavier/thicker polyurethanecoating(waterproofing) on both the floor and the rainfly. Is probably quicker to set up, due to the fewer number of poles that need to be assembled and attached together. Fewer parts to loose. If it were my money, I know which tent I'd be buying. That's the beauty of having 2 vestibules on the Wanderer. You can store all your gear in one and use the other as a protected entrance/exit to your tent, without fear of getting the inner tent wet in a down pour. 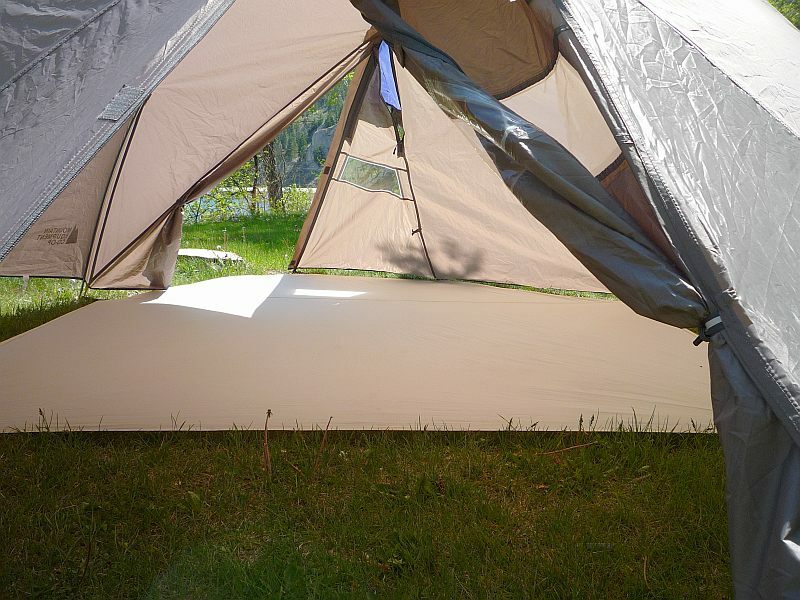 The foot print helps to save premature 'wear n tear' on the tent's floor. A wise investment, although in your case Dave, the plastic is just as good as what Eureka offers as a 'footprint'. . The thing I like about the Wanderer 2's footprint is that it is custom made for it and besides extending into one of the tent's vestibules, has attachment points that fit on the bottom of the poles, which lets you set up just the fly and the footprint if it's raining out and then set up the inner tent, under the protection of the fly. Why in da heck did I have to make camp next to you at Calhoun, when you had all that extra room ??? Shooter, that was the Wanderer 4, the Wanderer 2's larger sibling, that I had down at Calhoun. Yup too much room in there for what I need when touring by myself. This would be MEC's equivilent to the Eureka Timberline Outfitter 4, although the second vestibule for the Wanderer 4 is $21.42US option. I have the Big Agnes Emerald Mountain 3 and love it. My lady &amp; I spent 12 hours in it once during a huge storm in North Florida. The tent never leaked nor did we experience any condensation. It was developed for backpacking and is considered a 3 season ultralight intended to house three adults. Everything, the tent, the rain fly, thefoot print, the poles, stakes and guy lines all compress into a neat little bag which fits into the bottom of one saddle bagon my '86 1200I; andI have plenty ofroom to stow other equipment with it. I can have it up in under ten minutes.It is a bit pricey butI have seen it on line for $250. As soon as I figure out how to post photo's I will. I Ride a GL 1200 because it is my favroite Bike not the other way around. While I'm sure the BA Emerald 3 is a fine tent, I don't care for an all mesh body tent, as condensation can drip down into the inner tent. 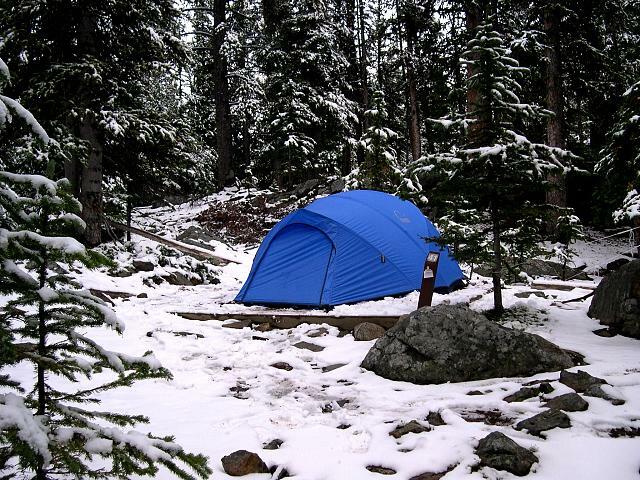 This happened to me while backpacking up in the Cathedrals in Southern BC, in early Septand 6" of wet, heavy snow fell. The next 3 days saw temps a degree above/below freezing and it was either snowing, or raining. The fly built up with condensation, despite having the vestibule open and dripped down inside the tent, through the mesh, making everything damp inside. The Wanderer 2 also comes in a mesh version but I stayed away from that, due to my previous experiences with a full mesh bodied tent. I like REI for the lifetime warranty, but this tent is pretty nice. The REI half dome 2 tent only has one vestibule without the floor. I might have to get one of these MECs. edit: opps I was wrong the REI also has two vestibules.